Necklaces are the cornerstone of any jewelry collections. A stunning pair of earrings can go a long way and the perfect bracelet is often the finishing touch to a complete ensemble. But the star of every show for a jewelry lover is the necklace. From chunky, richly colored statement pieces to the most delicate of bezeled chains, your collection is probably wide and tricky to store. Each necklace you add to your collection presents a new and unique challenge to store it. Some require a lay flat storage, other pieces of fine jewelry are safest in their jeweler’s felt-lined box but most are quite safe to hang. The challenge is finding enough space to hang them all properly. Necklace holders are a must-have for any jewelry lover and we have located ten that we are having trouble choosing from! If we’re being really honest, we have enough necklaces we could probably use ALL TEN! The first on our list is a bit of a one-stop shop for jewelry. Constructed of rough-hewn timber with a mesh wire over the frame, this rustic wonder has a place for everything. The mesh is the perfect spot for all of your earrings and the dowel along the top is removable so even your hard to store bangles have a place for safe-keeping. The cabinet knob finials on the end of the dowel really complete the rustic vibe. It looks as if it was constructed of charming salvaged parts. The best part for us though is the sixteen hooks along the bottom for your necklaces. Because this one is wall hanging, you can hang it at the correct height to give your longest pieces the room they need. We actually recommend getting one of each as some chunkier, heavier pieces make hanging them difficult. The SoCal rustic holder comes ready to use and prepared with wall hooks for mounting. The drywall anchors are even included so you do not have to go hunt for a stud to ensure your jewelry collection does not take a tumble moments after hanging it all up. We really like that this particular piece is hackable. Since it is rustic that means there is no glazing, waxing or finishing coat to it. This translate to mean it ships to you already prepped for a nice coat of paint. If the raw wood look will not look right in your space, a can of spray paint will do the trick. Two coats in the color of your choice and it goes from rustic to shabby chic in the time it takes to dry. To keep the rustic look but add some color, give the SoCal a coat of a minty green, a warm coral, a creamy ivory or a robin’s egg blue. After it has dried completely, take a bit of sandpaper or even a rough stone and rub the edges, wearing down the paint for a weather-beaten look. This unique and functional jewelry holder is great for all the outfit planners and folks who lay their clothes out the night before. 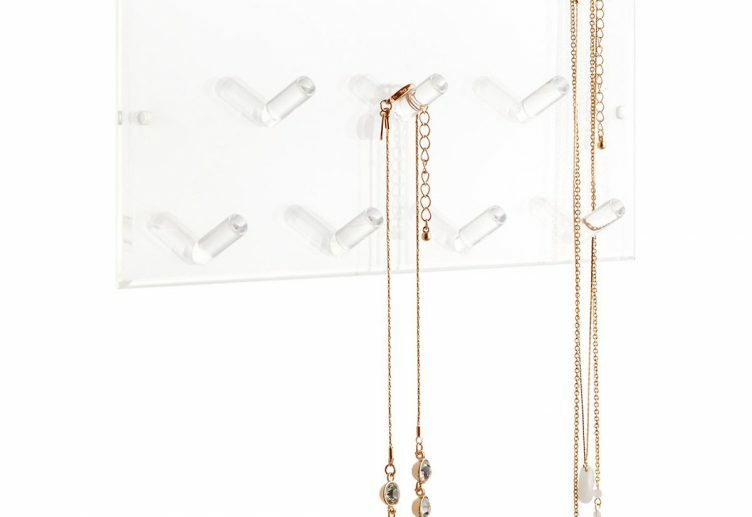 The wall-mounted jewelry organizer holds only necklaces but its design is genius. 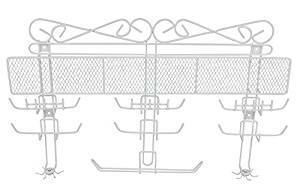 The eight-inch scrollwork metal frames a single bar that holds 20 S hook necklace holders. These are fantastic on so many levels. You can scoot these hooks around to make room for chunkier pieces, a feature not available on most wall-hanging holders. Many of those have fixed cup style hooks, making hanging up all your statement pieces a challenge. Either the pieces are still draped on top of each other risking bulkier bits still tangling or snagging on each other or you end up having to leave a few hooks on either side of the necklace empty, thereby wasting that precious storage space. This scrollwork holder solves that. Simply scoot the S Hooks over to make the room you need. Wondering how this should appeal to the jewelry and outfit planners? The hooks are removable so when you lay your outfit out you can hang the S Hook with it, giving you a safe place to keep your jewelry from tangling up or accidentally falling to the floor while you are getting ready. This hanger is also great for those who travel often. Pack the S Hooks in your luggage and you can safely hang your jewelry in the hotel closet. No more tangling headaches because your jewelry has been tossed around in a zipper bag and, most importantly, no more kinks in the finer chains because they had to stay all balled up until it was time to wear them. Plus if you need more S Hooks they are easily procured online or in person at your local hardware store. This necklace holder is also paintable so you need not feel discouraged if you are not fond of the black aesthetic. The scrollwork is simple yet elegant and will complement any room design. This one is another wall mounted necklace holder but we really love wall-mounted organizers. We prefer wall hanging holders because they don’t take up your precious table or counter space and it turns your jewelry collection into a piece of art, proudly displayed. Some tabletop jewelry hangers don’t really leave enough room for the longer necklaces and chains in your collection. Wall-mounted necklace holders are the perfect solution. This one is even versatile in how you install it. Brackets are built in to screw it directly to your wall. As an alternative, you can also turn this into an over the door mounted necklace holder. Use two over the door hangers and position them under the straight bar beside the built-in brackets. This is a wonderful option for apartment or flat living or space without much room to spare on the shelves or the walls. This organizer is quite a find as well just for the sheer size of it. Built by Ocean Tailer, they describe the styling as inspired by a vintage birdcage. The slightly angular swirls around the top definitely give off that vibe. To us, it feels very 1950s in its aura. It would fit perfectly with any Betty Style or Pin-Up Decor. Attach a couple of bulky shabby chic flowers to one corner and it moves perfectly from mid-century modern to boho perfection in no time. For an incredibly reasonable price, you get enough space for a significant portion of your collection. A mesh back for your earring, ring holders, bars aplenty for bracelets and choker style necklaces and, our favorite feature on this organizer, two spinning hooks that can hold up to ten longer necklaces. The branched and tiered construction spreads your collection out for easy viewing and access. Measuring nearly twenty-five inches across you’ll have plenty of space to display and organize your full collection. This mirrored armoire might be considered a little more than just a necklace holder but we are absolutely over the moon in love with this one. 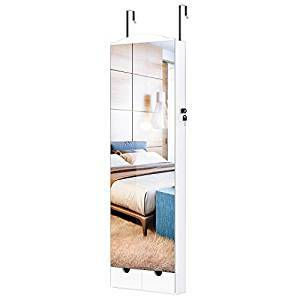 It hangs from the door with two heavy duty door hanging hooks and when closed provides a three quarter length edge to edge mirror, over forty-one inches long. The hangers are adjustable to three heights so you can hang the mirror at a reasonable height for you. Finished in a white veneer with a simple graceful arch at the top, it will blend in with any decor. There is nothing obtrusive or distracting about the straightforward aesthetic nor is it fashioned in any sort of style that will not allow it to blend seamlessly into your room, closet or washroom. However, it is when you open this jewelry armoire that the magic truly begins. The slender cabinet feature includes sixty earring slots, thirty-two earring holes, one hanging rod for bracelets, thirty-two necklace hooks, a ring pillow for up to eighty-four rings, one tri-sectioned pouch, six storage shelves, and two external drawers. That means this organizer holds close to two hundred pieces of your collection. The cabinet is lighted with a series of LEDs (powered by AAA batteries) so it feels very lux to open your jewelry armoire and have all the sparkles and shine of your collection highlighted by the lights. The necklace hooks are slightly offset giving you the chance to spread out some of the bulkier pieces and vary the hang height of the longer pieces with charms or pendants, making finding the piece you need just a bit easier. The interior is covered in a lush, low fuzz black velvet to protect your jewelry and make it stand out. And the piece de resistance of this entire package is the lock. You can secure your valuables inside this box and when closed no one would have reason to believe it was more than a mirror. What more could a jewelry lover need? All this storage comes with a bit of a price tag of course but for what you get we feel it is still an absolute steal. This jewelry box is tailor-made for your finer pieces. 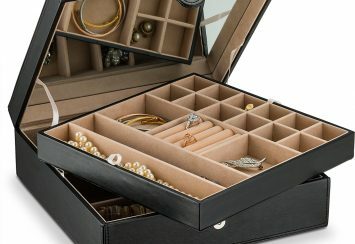 Styled with a jeweler’s case as the inspiration, this box is as elegant as your high-end pieces. 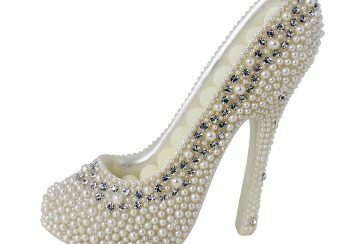 The more delicate construction of high-end jewelry always presents a challenge in storage. Many of them need to be laid flat to preserve the integrity of the chain and even if hung, they tangle so easily. The thinner the chain the great the risk of an unresolvable not. Box chains, a common chain choice for fine jewelry, are the worst about twirling themselves up into the worst knots. 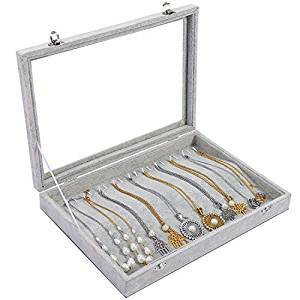 With this display style case, you can store your necklaces safely. The two-inch depth interior even features a soft curvature and is lined with super soft gray velvet so the pieces will lay in a beautiful display ready arrangement. It is 13.15 inches of necklace storage. Twenty prongs along the tops secure each piece into its place. Pro-tip: If your necklace includes an attached extender, use a second prong to pin the excess down, preventing it from tangling with nearby chains. Charms, pendants, lockets, and baubles have a flat resting place at the bottom. The tempered glass top on the case means that even while storing them, you don’t have to give up admiring your collection. As it is tempered it means that should the unthinkable happen and the box takes a tumble, should the glass break it will break into larger pieces instead of shattering into tiny shards, potentially damaging your necklaces stored inside. We can almost imagine this case being tucked away inside a fine jeweler’s safe to keep the valuables it contains secure. It will certainly add a certain sense of elegant mystery to your jewelry storage. This box is also ideal for bracelets and anklets if those feature prominently in your collection. Pasutewel actually offers an entire line of jewelry storage boxes with this same grey velvet and glass top. From earring boxes to ring pillows, you can for a very reasonable price, amass an entire collection of display cases for your jewelry storage and display. We love this piece so much we have to give a shout out to the rest of the collection! This combination of trendy rose gold with luxurious marble is an art-deco lover’s dream. The mixed media look of stone and gold makes this three-piece set an eye-catcher even without the jewelry. The stand features necklace pegs and a bracelet bar. It measures twelve and a half inches so your longer pieces will still need additional storage unless they can safely be looped but that doesn’t stop us from adoring this set. The three-tiered tray is great for storing rings, bracelets, and earrings. And the trinket box is almost custom made for your favorite rings. The marble feels so incredibly elegant. Marble is famous as a high-end building material, costly but sturdy. Unlike most stones, marble is prized for what makes it imperfect. In the jewelry world, we want our stones and gems flawless. Marble is best known for those beautiful striations, known in the geology world as well as the jewelry world as inclusions and exceptions. Strips of calcite or dolomite flow through the limestone to create that characteristic dual or tri-tone effect. Unpolished marble is almost glittery while polished marble, that look which is featured in this three-piece set, gleams with a glass-like finish thanks to hours of buffing and sanding until the stone is smooth. The rose gold bars mounted into the marble styled polyresin are sturdy alloy colored as rose gold. By not using rose gold, rose gold plating or true marble, the creators can pass on the savings to you and the extremely reasonable cost of this set reflects that. This set is certainly a statement maker and simply begs to be displayed on a vanity filled with art deco touches and all the glamorous exuberance of the 1920s. This one is specifically for the world travelers and ambitious jet-setting business folks among our readers. 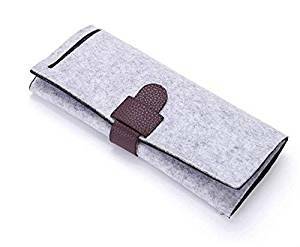 A clever yet still stylish trifold design, at first glance this darling little clutch does not look like a jewelry holder at all. But open it up and it is custom made to safely transport your favorite pieces tangle and baggie free. Make your jewelry as travel-ready as you are, the inside of the MEBOX can store three necklaces, fifteen pairs of earrings, and at least six rings. Inside, the necklaces are secured with three snapped loops, keeping everything still with an ingenious and clean design. The back pocket can store bracelets, cleaning cloths or additional pendants if you have a swappable chain. Made of sturdy, stiffened felt with leatherette slide closures, the ten inch by four-inch clutch (when closed) will fit in your carry on luggage so you can avoid all the jostling of the checked luggage. Additionally if traveling in the United States, the incredibly clean and secure snaps make it a breeze to get through airport security. If they ask to see the contents, simply slide it open, unroll the clutch and your jewelry will remain snugly organized. A word of caution for traveler’s, American airport security can sometimes be fickle about what constitutes a threat. When traveling avoid carrying pieces that resemble weaponry or pieces that may have a particularly sharp point. These may be seized and not returned. If such pieces MUST travel with you, consider carefully shipping them in your checked luggage. This jewelry clutch will travel just as nicely there and you don’t risk potentially losing one of your favorite pieces. The MEBOX is also fantastic for folks who stay over at friends or significant others’ places often. Keep your jewelry safe from scratches, scuffs, and damage inside the MEBOX when you spend the night away from your collection. The clutch is available in two color combinations; light grey with a black interior and rich black with a grey interior. 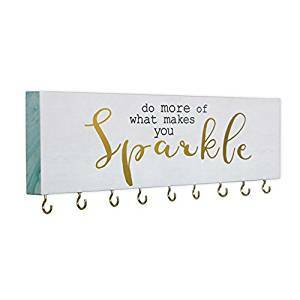 This simple piece is one of our favorites as it combines the practicality of a wall mounted jewelry organizer with a stylish message of self-affirmation. The fourteen-inch wood slab is painted white and features the quote “Do More of What Makes You Sparkle.” With the best sense of design, the word Sparkle is big, bold and does, in fact, sparkle through gold foil lettering. The message is proudly proclaimed above nine jewelry hooks. So while it doesn’t offer the most amount of storage but it is so cute we could not leave it off the list. We would hang our sparkliest, blingiest pieces under the little affirmation so every time we go to grab a bit of shiny jewelry we are showered with a bit of positivity. This piece gives both positivity and organization, both things everyone can always use a little more of. Bonus time: This is another piece that is hackable. The edges come painted in a teal color. You have a few options to really customize this. First and simplest is just a fresh color. Mask off the face and hooks with masking tape and a bit of newspaper and paint the edges the color of your choice. Alternatively, if you are loving the teal but want to go for more of a rustic look, purchase a small jar of crackle paint and follow the accompanying instructions. Once dry and cracked, the modern teal color will peak through. Finally, if you really want to jazz your new jewelry hanger up with a touch of your own personality we have two words for you: washi tape. The fun and colorful tapes come in almost any pattern or design you can think of. Available online or in your local craft store, run a few strips of your favorite pattern down the edges of the board and it will add a pop of additional color and really make the sign yours. We adore this wall-mounted, Moroccan inspired jewelry organizer. 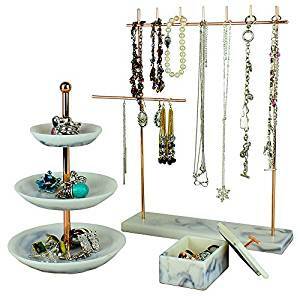 It features seven hooks for your necklaces, a bracelet bar, earring hangers for several pairs of earrings and a shelf along the top great for storing those bangle sets, sunglasses, or jewelry cleaner. 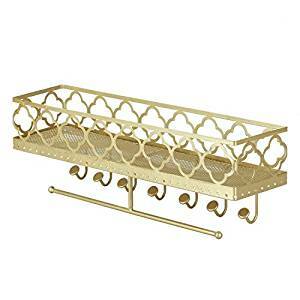 Constructed of a sturdy but not too thick metal, this gold colored organizer is so warm and vibrant. The fifteen-inch shelf is surrounded by a gorgeous wall of simple, delicate Moroccan Arabesques. An arabesque is part of an art form common to not only to Morocco but several North African and the Middle Eastern cultures. While most of us recognize the distinct shape shown on this jewelry organizer by Simmer Stone, an arabesque can be any sort of scrolling, repeating design. Many arabesques feature long vines and tendrils of bright colors traipsing about, sometimes presented as a background to a scene and sometimes presented alone as a surface decoration. Other common themes in arabesques besides the tessellated shape we are all familiar with are half-palmettes, thirteen and fourteen point stars, and honeysuckle styled vine work. By far the most recognizable in today’s trend is this style presented here. 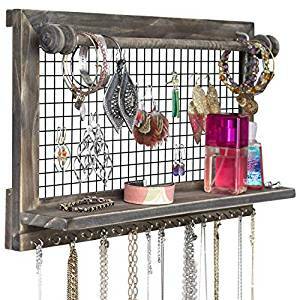 This jewelry organizer would naturally look wonderful in a rich Moroccan styled room but could also work in a shabby chic look or an art deco look. This same shape was a recurring theme in the iconic style the developed shortly after the turn of the twentieth century. Use the shelf to display some vintage perfume puff bottles and add some pops of emerald green and ebony black nearby to shift it from exotic Morocco to refined art deco. This one may offer the smallest amount of storage on the list but we couldn’t resist the trendy arrow design. It allows you to display your very favorite necklaces as a prominent feature in your home decor choices. 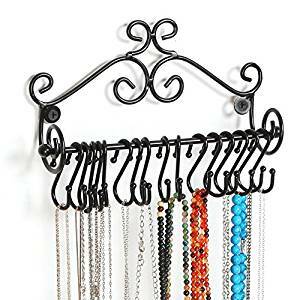 With only six hooks and no bracelet bar or earring hangers, this is more of a display your very favorite pieces and keep them from tangling than it is a true organization solution. But we really don’t mind as it just as cute as it is functional, even if small. The feathered, or fletched, arrow has garnered a lot of popularity in recent years. Celebrities like Rumor Willis sport arrow tattoos and they are very popular both in fashion and home decor trends. The arrow holds a lot of significance. Originally a symbol of violence as the arrow dates back to prehistoric history as a weapon. Today a single arrow can represent a sense of strength, determination, and protection from harm. It can also represent the perpetual drive to be moving forward and always having a mind to progress. We think this is a fantastic excuse to hang your most favorite pieces in the living room. Since the necklace holder will only hold a few, pick your strongest pieces, most artistic pieces and hang them on true display from your arrow. We all love the artistry of jewelry. There’s really no reason for it not to be on display when you aren’t wearing it. 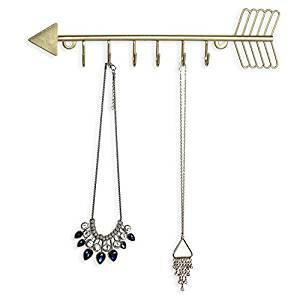 And there is even less reason to relegate it to the dressing room when you can display them on a trendy, fashion-forward and deeply meaningful piece like this arrow hanger. Organization is good for the soul. Perhaps not as good as finding the perfect choker charm to complete a look but it is still good. Our ten selections for necklace holder are a great step in the right direction for organization. No one wants to spend a chunk of their morning routine fishing through a pile of tangled jewelry only to discover the piece they were thinking of is so hopelessly entangled they have to give it up and find a more accessible one. But just because you need to keep your jewelry organized doesn’t mean you have to hang them from boring bars. Your good taste in fashion can extend to your walls and tabletops as well. 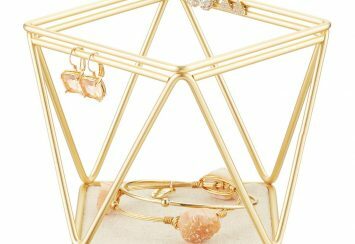 We hope these jewelry holder recommendations strike your fancy just as much as they did ours and inspire you to get organized in style.